TRANSCRIPT from: Statewide Mornings with Leon Compton ABC 936 Hobart, 14 April 2011. Topic: Ageing challenge in Australia. HOST: The Minister for Mental Health and Ageing was in town last night, a talk that was held at the Menzies Research Centre, just a stone’s throw from where I’m sitting right now. I suppose it would be fair to say the aim of most of us would be to live a long and happy life. We’re certainly good at living a long life. The question is, how happy are we as we do it and how well are the Government going at addressing the challenges of policy settings that will help Australians live a happy life where we come into contact with Government. The man whose job that is to find ways of caring for an ageing population and get the happy part right is the Minister for Mental Health and Ageing, Mark Butler. As I said, he was in town last night. I caught up with him a little earlier this morning and I started by asking him, if when we talk with people who are ageing, the experience is what they expected. Here’s a little of what he had to say. BUTLER: Well, I think that story is still unfolding and it’s a challenge we still have to come with grips with I think because as you say there are a whole lot of challenges in the care space that we have as we have a population that lives longer. But we also think should about, in a more positive frame, ways in which older Australians can continue to live healthy, productive lives, where they’re able to continue to contribute to society within their family, within their community and at work as well. So I see this, perhaps along with climate change, as the really big social challenge for this decade, that we’ve got to come to grips with. HOST: Where is the change going on at the moment to meet that enormous challenge? There are worries about health care funding in Australia, there are worries about the adequacy of the pension, there are challenges in terms of what will happen to people as they require more care and finding the people to do that caring. Where is the policy prescriptions to meet those growing challenges? BUTLER: Well, in a number of areas. One is the health reform process that we’ve been undertaking for a while now. As much as it’s directed at improving the quality of service today, it’s also directed at making sure that our health system is sustainable in the face of that extra demand we’re going to get on it through an ageing population. The aged care reforms that we’re currently looking at for the Productivity Commission, and I’m talking to some people in the sector today about that here in Hobart, they’re also about making sure that the system delivers the care that older Australians today need and is sustainable. Because we also know that the older population today means that we’ve got more complex needs for people who particularly are set in residential care. But on the other hand, I think we also need to look at our workplace culture so that people, if they wish, after 65, are able to continue to make a contribution, to look at our community culture to see ways in which people over 65 can continue to contribute through mentoring, through volunteering, a range of things that many of them have been doing for many, many years and do today as well. But these opportunities are going to expand and we should exploit those opportunities as a community, because these people have a great deal of experience and a great deal of knowledge and wisdom to contribute. HOST: In 10 and 20 years time as the baby boomers age and come towards the end of their lives, how will the experience of ageing and the Government interface with that, through aged care and other policy settings change? What will look different? 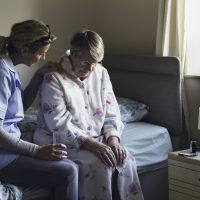 BUTLER: Well, what will look different particularly in the aged care space, I think, is that more and more people are going to ask to be cared for at home. That’s already happening and it’s been happening for some time. But what I think we will see is a huge expansion of what we call community care, which is people being provided with care at their home. At the moment that is almost all face to face care, so carers visiting a person’s home. But we know that with information technology and communication technology revolutions, the roll out of the National Broadband Network, that there are going to be opportunities for remote care to be provided at home through eHealth solutions as well. So I think that’s going to be the big thing, more independent living for longer by people. And that’s certainly what older Australians are telling us very clearly that they want. HOST: Can you give us an example of remote care via the internet? BUTLER: Well one, I know there are some down here that I haven’t actually seen face to face, but in my home town of Adelaide for example, the RDNS, the District Nursing Service is able to Skype in to older Australians living at home with dementia, often living alone at home with dementia, and on a video link check that they are taking their appropriate medications. So get the older person to hold up their dosette pack and take the medication in front of the nurse who is on the other side of the Skype. Now, to be able to do that across Australia you’re going to need to ensure that there is appropriate bandwidth, which is connected to the NBN. But what this means is that the older Australian is able just simply to have a phone call done through Skype and get the thing done but also, we don’t have to have a carer getting in a car, driving to that person’s house, simply for the purpose of making sure that they’ve taken their medication. COMPTON: I was just thinking for a moment as to whether or not we might in fact outsource that to call centres in other parts of the world. I say that because it seems at the moment we can’t find enough people to provide the aged care that we need, the workforce will decline and the number of people requiring aged care is to grow. BUTLER: Well, the number of people requiring aged care is going to grow dramatically. The Productivity Commission tells us that we’ll probably need about triple the number of workers in aged care that we have now, over the next 40 years. I mean, there aren’t many industries you can say that about. We already have about quarter of a million people working in aged care, so this is a huge, huge challenge for us and one that is very much a central part of the work that the Productivity Commission is now doing. I know they’ve had public hearings around the country over the last few weeks, including I think here in Hobart, and have been taking written submissions about what sort of aged care system we want for the next 20 or 30 years. And getting a sustainable, high quality, well-trained workforce that is paid appropriately as well, is one of the very clear terms of reference we’ve given to the commission. HOST: On your local ABC, my guest this morning, Mark Butler, Federal Minister for Mental Health and Ageing. Mr Butler, before we leave you this morning, last night before you left the auditorium in Hobart somebody buttonholed you on the subject of ongoing funding towards health research in Tasmania. Significant arthritis research happens here as well as multiple sclerosis research happening here, and yet the word is out of Treasury at the moment, and discussions on the Budget, that funding for exactly that sort of research might well be in the gun. Serious on ageing policy on one hand, but potentially cutting funding for research into some of the diseases of ageing on the other? BUTLER: Well, you’re right. Last night I was giving a lecture on ageing at the Menzies Institute, an institute that I’ve visited on a number of occasions now and I’m familiar with the work they do there which is quite unique in many cases. Some work there being done that’s not really done anywhere else. But in general terms I think the number of ministers responsible for the budget, Penny Wong, Wayne Swan and also Nicola Roxon have responded to this. And the difficulty for us is that this is a pre budget period, when all sorts of speculation swirls around about cuts and enhancements to funding and we’re simply not in a position to be able to respond to different levels of speculation, including about this one. HOST: [Interrupts] Will we know that you’re serious about your portfolio of ageing if the funding for research into these sorts of things continues unabated? BUTLER: Well, that’s a judgement people have to make on budget night when they balance all of the different programs that are funded. But I think Penny Wong and Wayne Swan have made the point that this is going to be a very tough Budget. There are all sorts of pressures that particularly have been coming on the Budget over recent months, the natural disasters we’ve seen and the continuing softness in the economy after the GFC and the high dollar really is hitting the revenue base of the federal Budget very significantly. But we don’t – we can’t respond to every bit of speculation, whether it’s about medical research funding or frankly a whole lot of other speculation in my portfolio and other portfolios that are floating around. We take research very seriously. We see it’s a very clearly integrated program for ageing, for mental health and for the health sector generally but other than that we simply can’t respond to that speculation. HOST: Not playing the rule in/rule out game. That was the Minister for Health and Ageing. I spoke with him a little earlier this morning. He spoke last night at Menzies in UTas, the medical research facility just near the roundabout where the ABC’s located in Hobart. An amazing facility, I got a bit of a tour with the rest of the people who had turned up for a talk. A lot of research happens there, particularly affecting those of us going through the ageing process and a lot of concerned researchers worried what will happen to their programs if funding is cut. It will be interesting to see what happens in the Budget come the second week of May. Maintaining a good quality of life is something we should all aspire to as we age. It is reasuring that the government supports this notion. It is also evident that along with maintaining a good quality of life as we age, we should also aim, through advanced care planning, to have the type of care we both need and wish for at the end of life. Quality palliative care is needed for a rapidly ageing population. The baby boomers will soon be boosting the numbers requiring health care even further. Many of these boomers live alone, so advanced care planning is even more critical. Palliative Care Week, 22-28 May, will focus on this issue and will be highlighting the need to think ahead and plan for quality end of life care.